Are you a tech junkie? Do you have the iPad with iPencil but never know what to do with the iPencil? I have a solution for you. 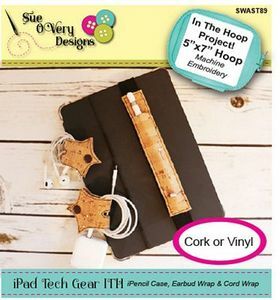 This trio set includes (2) cord wrappers (fits a 4x4 hoop), one small for ear buds and second large (fits a 5x7 hoop) for the power cord and best of all, an iPencil case. This super techy case holds the iPencil and the extra connector, all wrapped up secured with elastic and wrapped around your iPad. This trio is a perfect project to use non-woven materials such as Cork or vinyl. Final dimensions for small cord wrapper 2-1/4in wide x 5in tall, large cord wrapper 2-3/4in x 5-3/4in and iPencil case 1-1/4in wide x 7-1/4in tall. Perfect Cork scrap buster.